A forest, also referred to as a wood or the woods, is an area with a high density of trees. 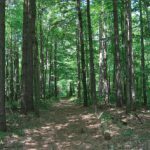 As with cities, depending on various cultural definitions, what is considered a forest may vary significantly in size and have different classifications according to how and what of the forest is composed. 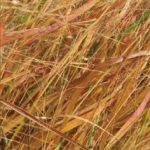 Prairies are considered part of the temperate grasslands, savannas, and shrublands biome by ecologists, based on similar temperate climates, moderate rainfall, and grasses, herbs and shrubs, rather than trees, as the dominant vegetation type. Wetland is a land area that is saturated with water, either permanently or seasonally, such that it takes on characteristics that distinguish is as a distinct ecosystem. 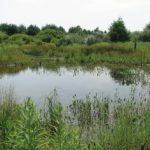 The primary factor that distinguishes wetlands is the characteristic vegetation that is adapted to its unique soil conditions: Wetlands are made up primarily of hydric soil, which supports aquatic plants.